The text for this course is Cengage Learning's Basic Math, 9th Edition by Aufmann and Lockwood. This sixth grade course includes one chapter each on whole numbers, fractions, decimals, ratio and proportion, percents, applications for business and consumers, statistics and probability, U.S. customary units of measurement, the metric system of measurement, rational numbers, introduction to algebra, and geometry. With the addition of the last three chapters (which were not included in previous editions), this is a solid sixth grade course. Many practical applications appear in examples and word problems, and an entire chapter is devoted to business and consumer math skills such as percent calculations in making purchases, computing interest, calculating the cost of buying a home or car, calculating wages, and balancing a checkbook. A four-function calculator might be used along with this course, but it's not absolutely essential. If you are looking ahead, you might want to go ahead and purchase a TI-83 Plus graphing calculator since it can be used with all courses. "I had talked to you about 2 1/2 years ago. One son was repeating Basic Math for the third time. You encouraged me and he finally understood it. He went on last year to do well in Algebra 1 in public school. He is doing well and has a good grasp of math. He is in his sophmore year enjoying Geometry. Thank you." My son has used the Chalk Dust Basic Math for this school year and has completed the program. The DVD sessions with Uncle Buck have provided consistent, thorough explanation of math concepts for him. We definitely plan to use Chalk Dust in our home school for his middle and high school math. Thanks for your great program." This year we have been using your Basic Math program with "Uncle Buck" on the videos. We are so pleased. My daughter feels she is now prepared and has a full understanding of math for the test. Thank you. We can't say enough good things about this program. We enjoy "Uncle Buck" and his methodical teaching style. He incorporates review without calling it that. He builds the child's confidence in a step-by-step learning style so that the child feels any problem can be conquered when it is broken down in steps. 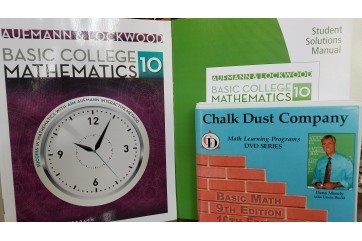 We are looking forward to purchasing Chalkdust Pre-Algebra and continuing on. I also appreciate you taking the time to help me know which "math track" my daughter should take as we approach high school." Basic Math. "Mr. Mosely, we started Section 2 and my child is finally saying that he is getting to "love math", but only after purchasing your videos." Ginger McCreery, for Jesse, Hannah and Rachel McCreery"
"Chalk Dust Basic Math covers six major topics: whole numbers, fractions, decimals, ratio, and proportion, percent, and "Applications for Business and Consumers: A Calculator Approach." This last chapter is almost 100 percent word problems. It covers topics found in both business math and consumer math texts: purchasing, percent increase and decrease, interest, real estate expenses, car expense, wages, and bank statements. I've found that children in grade 5 and up can jump right into this course (with adult supervision and assistance), while it's a great review for teens and parents." "We purchased your Basic Math videotape course about 30 days ago. I wanted to share with you some of my 11 year old son's comments. Today he said, 'He makes math so much easier. He is so smart!' I am really impressed! Thank you Chalk Dust Company!" You must have Flash software installed on your computer and at least a DSL connection to view these videos.